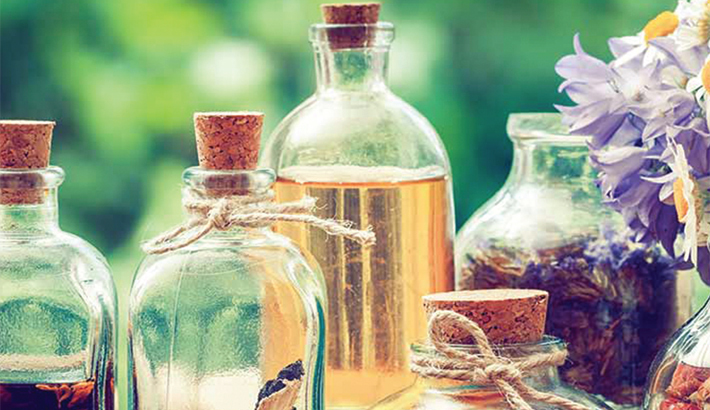 Essential Oils: Why Are Those Necessary For Your Hair? This sweet-smelling flower is known for relieving stress and anxiety. But that’s not all! It is one of the very few oils that work on all hair types. According to some studies, massaging lavender oil with other herbs and carrier oils on your scalp may help with hair loss. It moisturizes the scalp and balances sebum secretion. Its anti-inflammatory, antiseptic, and anti-nociceptive properties also make it a compelling choice for treating alopecia areata. It can also be used to fight bacteria and fungus. Simply mix 4 to 5 drops of lavender essential oil with coconut or olive oil. Massage this mixture gently onto your scalp. Leave it on for 4 to 5 hours before washing it out with a shampoo. This is one oil type that those really conscious of their beauty are bound to know. Peppermint oil is packed with conditioning and nourishing properties. Peppermint oil induces rapid hair growth from the roots and strengthens the hair follicles. Its antiseptic, antifungal, and antibacterial properties can heal scalp inflammation and treat dandruff and head lice. It prevents premature graying of hair by protecting your natural hair colour. The pungent aroma of peppermint oil also enhances energy, lifts your mood, and relieves stress. Combine peppermint oil, coconut oil, and olive oil and massage the mixture onto your scalp. Leave it on for at least 3 hours. Let the mixture soak in thoroughly before washing it out. An alternative method is to add the mixture to your shampoo or conditioner. If you look at beauty blogs over the net, you will find the name of this essential oil a lot. This floral essential oil is great for healing and soothing your scalp. It is a popular choice in aromatherapy and the hair care industry. Massaging your scalp with oil will enhance blood flow and boost the growth of new hair follicles. This nourishing oil prevents dryness and repairs the hair shafts, thus promoting fresh hair re-growth. It soothes itchiness on the scalp and treats skin inflammation. Simply mix the solution and apply it all over your scalp liberally. Leave it on for 4 to 5 hours or overnight. Rinse off thoroughly with lukewarm water and shampoo. Finally we have the tea tree essential oil! This is one we Bangladeshis are very familiar to. Unlike the other essential oils, this one is available in almost every superstore. For the other ones, you might have to do a bit of search. Tea tree oil has strong antifungal and antibacterial properties that help in treating dandruff, itchiness, and scaliness on the scalp. It eliminates dirt and keeps your scalp free of infection. A study reports state that tea tree oil can help in the treatment of androgenic alopecia and inflammation. You can use tea tree oil in a number of ways. You can add 8 drops of it to your shampoo. Another method is to add 3 drops of tea tree essential oil to 2 tablespoons of olive or coconut oil. Whichever oil you use, make sure you use a good shampoo to clean it. No matter how good essential oils are, they should not be left for more time than they are required. Don’t forget to put on conditioner after you shampoo your hair!